As moms, it seems like we always trying to do two things, save money and make money. While listening to The Eventural Millionaire I heard a millionaire sadly I cannot remember who talking about how he didn’t want to be stuck constantly pinching pennies… instead he would just make more money! 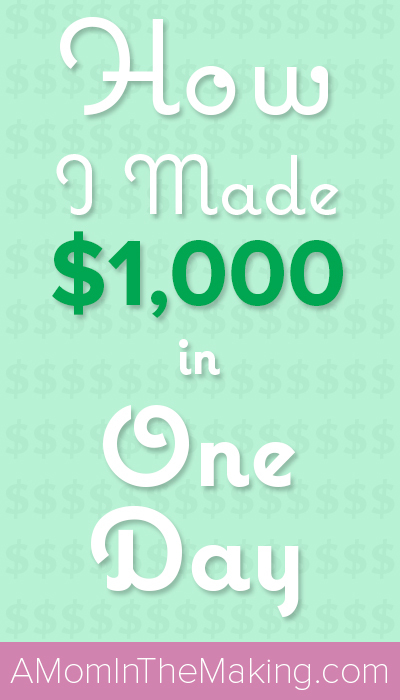 I made $1000 in One Day! If you feel like this is a greedy or odd post I’m not saying you need to have a trampoline where you jump in stacks of your money. But there are times when some additional income can help, pay off loans, take care of bills, or buy necessities for the house. You really do want to listen to the podcast! It has all the details! Say Yes to More than You Can Handle - For maybe a day or two… Try this for too long and you’ll find yourself weeping in a pool of chocolate and coffee. Basically, I found an opportunity. I created programs for libraries and schools for their summer reading and grant programs. I jumped in, not knowing exactly how it would go. Eventually, I was making between 200−250 for an hour storytime at the library. It truly was more involved than just that… more on the podcast. With a little bit of crazy… I booked 5 events in one day, because it was the only day they needed someone. BINGO $1000 in one day! Have you ever tried an idea for making money? How did it go?